For other uses, see You Can Count On Me (disambiguation). 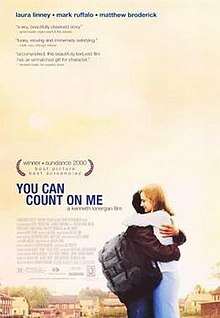 You Can Count On Me is a 2000 American drama film starring Laura Linney, Mark Ruffalo, Rory Culkin, and Matthew Broderick. Written and directed by Kenneth Lonergan, it tells the story of Sammy, a single mother living in a small town, and her complicated relationships with family and friends. The story takes place in the fictionalized Catskill communities of Scottsville and Auburn, New York. [note 1] The film was primarily shot in and around Margaretville, New York. The film and its performances received highly positive reviews among critics, and dozens of award nominations and awards at film festivals, especially during the awards season, including two Oscar nominations. As children, Sammy and Terry Prescott lose their parents to a car accident. Years later, Sammy (Laura Linney), a single mother and lending officer at a bank, still lives in her childhood home in Scottsville, New York, while Terry (Mark Ruffalo) has drifted around the country, scraping by and getting in and out of trouble. After months of no communication with his sister, Terry is desperate for money, so he comes to visit her and her son, Rudy (Rory Culkin), who are excited about reuniting with him. Sammy lends him the money, which he mails back to his girlfriend. After the girlfriend attempts suicide, he decides to extend his stay with his sister, which she welcomes. For a school writing assignment, Rudy imagines his absent father as a fantastic hero. Sammy only gives him vague descriptions of the truth while Terry lets his feelings be known about Rudy Sr.'s abandonment. Sammy rekindles a relationship with an old boyfriend, but is surprised when he proposes to her after a short time and says she needs time to consider it. At the bank, the new manager, Brian (Matthew Broderick), tries to make his mark with unusual demands about computer color schemes and daily timesheets. He is particularly tough on Sammy, requesting that she make arrangements for someone else to pick up her son from the school bus rather than leaving work. After some minor arguments, they end up having an affair, despite Brian's wife's being six months pregnant. Terry grows close to Rudy during their time together. Yet he pushes the limits of Sammy's parental control during a late-night game of pool at a bar. She turns to her minister (Kenneth Lonergan) to counsel Terry about his outlook on life. While Terry resists his sister's advice, he stays on good terms with his nephew. Realizing her own questionable decisions, Sammy turns down her boyfriend's marriage proposal and breaks off her relationship with Brian. After a day of fishing, Terry and Rudy decide to visit Rudy Sr. in the town of Auburn. Confronted by his past, Rudy Sr. (Josh Lucas) is incensed, leading Terry to assault him and get arrested. Sammy brings her brother and son home and asks Terry to move out, which he does the next day. He plans to go back to Alaska and scoffs at Sammy's suggestion to remain in town and get his life back on track. While at first it appears the separation will be another heartache, they reconcile before Terry leaves, coming to terms with their respective lifestyles. Josh Lucas as Rudy (Kolinsky) Sr. While the bank exteriors were filmed at Margaretville's NBT bank, the interiors were filmed in another bank closer to New York City since NBT considered interior filming a security risk. The scenes where Rudy Jr. walks home in the rain were filmed with the assistance of the Margaretville Fire Department which used their trucks and hoses to create the rain. Many outdoor scenes away from the Village—most notably the fishing trip—were filmed in Phoenicia, New York. The cemetery seen in the film is not the Village's—which cannot be seen from the road—rather it is a smaller cemetery four miles outside the village on Route 30. You Can Count On Me received highly positive reviews from critics. It has an approval rating of 95% on Rotten Tomatoes, based on 103 reviews, with an average rating of 8.1 out of 10. The website's critical consensus states, "You Can Count On Me may look like it belongs on the small screen, but the movie surprises with its simple yet affecting story. Beautifully acted and crafted, the movie will simply draw you in." The film also has a score of 85 out of 100 on Metacritic, based on 31 critics, indicating "universal acclaim". Reviewer Stephen Holden described the film as "the perfectly pitched directorial debut of the playwright (This Is Your Youth) and screenwriter (Analyze This) Kenneth Lonergan. Because it arrives near the end of one of the most dismal film seasons in memory, this melancholy little gem of a movie, which won two major awards at the Sundance Film Festival, qualifies as one of the two or three finest American films released this year....You Can Count on Me is an exquisitely observed slice of upstate New York life that reminds us there are still plenty of American communities where the pace is more human than computer-driven. The movie dares to portray small-town middle-class life in America as somewhat drab and predictable. Without ever condescending to its characters, it trusts that the everyday problems of ordinary people, if portrayed with enough knowledge, empathy and insight, can be as compelling as the most bizarre screaming carnival on The Jerry Springer Show." David Edelstein called the film the "best American movie of the year", noting that "[w]hat the film is 'about' can't be summed up in a line: Its themes remain just out of reach, its major conflicts sadly unresolved. But Lonergan writes bottomless dialogue. When his people open their mouths, what comes out is never a definitive expression of character: It's an awkward compromise between how they feel and what they're able to say; or how they feel and what they think they should say; or how they feel and what will best conceal how they feel. The common term for this is "subtext," and You Can Count on Me has a subtext so powerful that it reaches out and pulls you under. Even when the surface is tranquil, you know in your guts what's at stake." Edelstein concludes "Lonergan doesn't yet know how to make the camera show us things that his dialogue doesn't, but when you write dialogue like he does, you can take your time to learn. Hell, he can take another 20 movies to learn." According to Roger Ebert, "Beyond and beneath, that is the rich human story of You Can Count on Me. I love the way Lonergan shows his characters in flow, pressed this way and that by emotional tides and practical considerations. This is not a movie about people solving things. This is a movie about people living day to day with their plans, fears and desires. It's rare to get a good movie about the touchy adult relationship of a sister and brother. Rarer still for the director to be more fascinated by the process than the outcome. This is one of the best movies of the year." In a 2016 BBC poll, You Can Count On Me was voted by four critics as one of the greatest films since 2000. ^ While there is an actual Scottsville, New York and Auburn, New York, they are further west in the Finger Lakes region. ^ Posters for Margaretville's July 4 "Field Days" can be seen in shop windows. ^ a b "150 Years...and Counting: NBT Bank" (PDF). p. 43. Archived from the original (PDF) on 2010-10-09. ^ "You Can Count on Me (2000)". Rotten Tomatoes. Fandango Media. Retrieved April 10, 2018. ^ "You Can Count on Me Reviews". Metacritic. CBS Interactive. Retrieved April 10, 2018. ^ Holden, Stephen (November 10, 2000). "A Dysfunctional Family With Wounds Exposed". The New York Times. Retrieved 2014-02-21. ^ Edelstein, David (November 17, 2000). "The dialogue stars in You Can Count on Me". Slate. Retrieved 2014-02-21. ^ Ebert, Roger (November 17, 2000). "You Can Count on Me". . rogerebert.com. Retrieved 2014-02-21. ^ "The 21st century's 100 greatest films: Who voted?". BBC. August 23, 2016. Retrieved January 8, 2017. This page was last edited on 11 March 2019, at 11:00 (UTC).